Many IT organizations spend 80% of their time supporting and maintaining infrastructure equipment and applications, and only 10% on innovation. But modern business requires that those two percentages be reversed. GreenPages’ Managed IT Services enable clients to mature their operations, optimize their team’s focus and effectiveness, and improve the quality and agility of their environments. Modern IT organizations are faced with huge new challenges. IT is being asked to be an innovation center for the business, charged with uncovering new ways to add value. But how can IT embrace this new role while operating on traditional infrastructure with operational processes that weren't built for cloud? GreenPages helps clients bridge the gap between traditionally built and operated infrastructures to agile, modern hybrid cloud environments that leverage next-generation managed services. 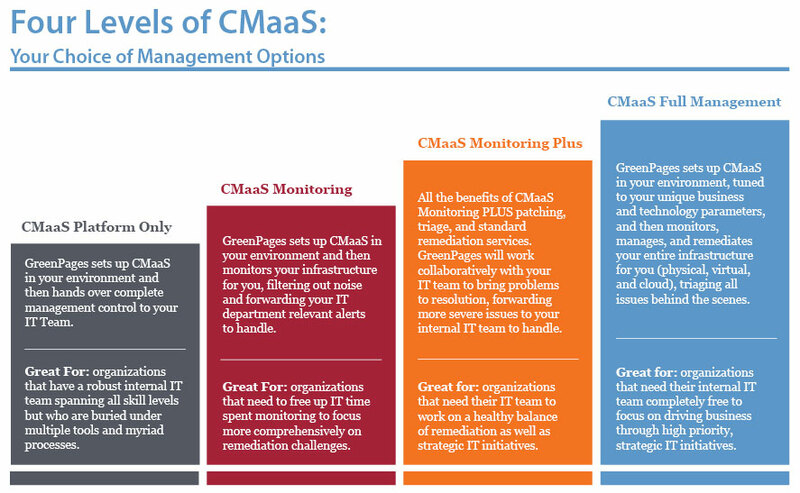 GreenPages Cloud Management as a Service (CMaaS) platform is a groundbreaking, affordable solution that gives organizations the benefits of enterprise cloud management tools at a fraction of the cost—a huge competitive advantage. Introducing GreenPages CMaaS Infrastructure and Operations platform. Enterprise-class management of physical, virtual, and cloud resources—through a single-pane-of-glass portal. The CMaaS Portal: A Single Pane of Glass to Control Everything in Your Production Environment—Physical, Virtual, Cloud. Manage Physical Resources: Manage servers, desktops, laptops, mobile devices, UPSes, applications, IPtel systems, printers, switches, routers, firewalls, and storage platforms. Manage Virtual Resources: Manage your entire virtual infrastructure and application stack, along with on-premise private cloud environments, vCloud director for example. Manage Cloud Resources: Manage your virtual environments located in any cloud-based resource (Terremark, Amazon, Rackspace, etc.) directly from the CMaaS Portal rather than logging into multiple systems. CMaaS connects to and enhances technologies you already have—no more struggling to manage multiple, disparate toolsets. By aggregating point solution tools, CMaaS provides clients one federated system from which to manage the entire infrastructure. And for any proprietary systems present in the environment, GreenPages’ application development team can develop APIs to integrate seamlessly into CMaaS. CMaaS is an “As a Service” Offering which means clients can mix and match levels to manage different infrastructure components. For example, choose Monitoring for servers, and choose Monitoring Plus for switches and network devices. GreenPages manages thousands of networks, workloads, and endpoints for our customers, including proactive patching and vulnerability management services. 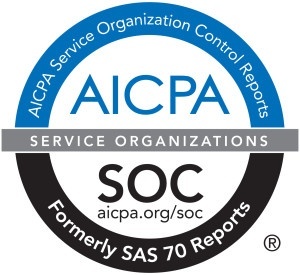 We are hyper-vigilant and SOC 2 compliant for the strictest security controls. IT Help Hub Services: Ensure end users—no matter their location, applications, or device—are able to quickly and easily access IT support and the systems they need to be productive. VDI Management: GreenPages’ VDI management experts help you leverage existing license agreements, management tools, network equipment, storage, and other infrastructure components. PC Management: Rely on GreenPages' dedicated computer services department to alleviate PC management tasks, with no extra staff, no overhead, and no hassles. Mobile Device Management: With time-bound, role-based security access services, you can secure any device while customizing for each user or department. When The Channel Company split from its parent company, they had to separate themselves from a vast amount of shared infrastructure and had to do so under the weight of looming deadlines dictated by the buyout agreement.